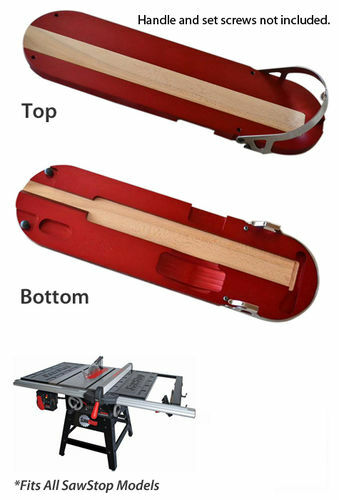 The sawstop zero clearance insert doesn’t have enough support towards the back of the blade therefore the insert dips down below the top of the table. When cutting narrow wood, the leading edge of the wood catches on the top of the table which isn’t a safe situation to be in.. I recently heard about the Infinity billet insert and ordered it the same day. I don’t have any relationship with Infinity. The insert is machined out of aluminum and has a very nice anodized finish. I had to use some of the hardware off my old sawstop unit but that wasn’t a problem. Using the hex screws accessible from the top of the insert I was able to set the insert height to match the table top perfectly. The billet material is solid enough to provide support across the entire insert. The kit comes with two melamine inserts that slide out of the unit so different saw blades can be used. I didn’t give the unit 5 stars for two reasons. 1) The replaceable melamine insert sits proud of the aluminum plate by about 0.005” which is enough to catch the front end of stock as it passes across the insert. I’ll call Infinity and ask if it’s intended to be proud or in they just machined the insert .005” too high by accident. I can sand the edges of the melamine to prevent it from “catching” in the future but it will still be high in the center. 2) The sawstop blade, in its lowered position, is very close to the top of the table. Therefore, the ZCI unit has to be lowered onto the blade while the saw is running to cut the replaceable melamine insert. The insert was shy by about 3/8” from the top of the table. I’m not sure what could be done about this unless they used thinner replaceable melamine or polycarbonate. I agree about the stock plate. Since I never use the guard I got around it by getting using a Sawstop dado zero clearance. I neatly routed it out for the riving knife only leaving the rear portion intact. So instead being split through the end it is contiguous both front and back. It performs much better than the split plate that is designed to accommodate the guard set up. But, if you use the guard then this solution won’t work since the phenolic is not up to it. Nice find mbs!. For a long time I didn’t use guards on much of my machines. I have more time on my hands now so I am trying to be a better boys scout by utilizing guards to save my fingers and lungs. Does it work with dado sets? It is exactly the same insert as the Colli-Beck except the name has changed. And it does work with the dado set. I would recommend breaking the edges on the table around the throat plate with a round metal file. That should prevent wood from getting caught should the insert dip at the back. I agree, having a .005” bump in the middle is unacceptable. You’d never get truly square cuts or be able to square the blade to the table. I routed the back face of the insert so the height is flush with the top. When using a splitter and raising the blade as high as it goes there isn’t much material left on the insert. Maybe 1/2” holds it together. It hasn’t broke yet but it’s pretty flimsy. I will likely make some out of hard wood in the future. I sent a message to Infinity asking if they intended for the proud insert or if I got a unit that slipped past their quality department.. I got an automated response that they would get back with me within 48 hours. I’ve been thinking about this. I almost bought a prototype of this product, but never pulled the trigger. The basic idea is appealing. I can give you Jack’s email address if you want it. The basic idea of this design is the replaceable part is a sliding dovetail. It’s pretty thick, and relatively narrow. I wonder if it would be better to just use a rabbited insert that was thinner and wider. It might be able to be made with a flat sheet with a couple of c channels or z shaped guides added to hold the insert. I think the dovetail design will work if the depth is set correctly. Infinity said they have redesigned the insert and they will send me a new one after I return mine. I think they ran into patent issues because their old design uses the locking mechanism parts patented by Sawstop. The new design doesnt have a locking mechanism. I’ll update the post after i’ve reviewed the new design..
Mbs, I can answer a few of your questions. First of all, the mis-match between your wood insert and the plate must have slipped past. The match is supposed to be +/- .002. Any more than that does not work optimally. Secondly, yes, we did run into patent issues with SawStop. We re-designed the plate and now it’s…awesome. Steve Gaas, the president of SS, didn’t like the fact that we were making the plates and selling them, since it is the first of its kind. Up to that point, no one had endeavored at making an aftermarket plate with all the clearances and compatibilities—and I know why! (It’s a pretty difficult plate to make well to meet the SS’s demanding requirements. Machine time is long and expensive.) As you wrote, SS’s one flaw was the ZCI. We’re here to fix that! Our plate is superior to SawStop’s plate and even to our first plate, which is somewhat similar to theirs. On the design you will receive, you will have a unique experience with height adjustment and lockdown. No plate has been designed to fit and adjust in such a way. The plate simply slips into the throat, with the saw’s adjustment screws slipping into the T-slots in the plate. As you’ll see, in/out of the plate has become easier. The plate is also .065” thicker for rigidity’s sake. You’ll receive inserts made perfectly for the standard riving knife (a closed back) and for blade guard/dust collection (an open back). My only “quibble” with the plate is that when the blade is at full extension (nearly 3.25” above the table), it comes awefully close to the plate. This close clearance was necessary for the rigidity of the plate. As you’ll see, if not for the strip of aluminum left between the blade opening and the foremost clearance port, rigidity would be left to the strength of the plate on its outer edges (as your first purchase was). Although the plate had much strength, we guarantee them never to twist or warp, so this assurance is kept all the better by the more material being left in critical places. Not very many people use the the blade to its full height, so this shouldn’t be a huge issue. If a cut must be made at full blade extension, my advice would be to bypass the stop or watch clearance at the front of the plate very closely. We are prototyping a plate that includes both the rigidity and full blade clearance at full extension. The rigidity tests are coming out well, so once we’ve fine-tuned some details, the plate should be on the market within the next couple of months. I, personally, prefer the model you’ll be receiving because it has the most rigidity and strength—and because I never cut at the blade’s full extension. Further, the plate you’ll be gettin has an insert “lockdown” system. In the past, some commented that the wood insert pinched once the zero-clearance slot met the riving knife slot. That was the case if (again, due to rigidity’s sake) the plate itself pinched inward from shipping/handling pressure. Now, with the new lockdown and added strength, not a problem. You’ll like this feature if you use the longer riving knives/open back inserts. The insert for the standard riving knife is closed-back, so there is never an issue there. Soon, the plate you’ll be receiving will be reviewed by several magazines and will be a very hot product for the SS. I’m glad you got yours early. Brtech—thanks for the reference. Yes, Colli-Beck makes the plates for Infinity. We are working with them closely on this plate. Jack – thanks for the reply. I just received my zci plate from infinity and noticed that my melamine inserts are below the plate surface. I expected it to be flushed to the top surface. How are the ones you guys purchased? I just emailed jack an infinity. -- famous line my wife hates to hear "we don't need to buy that. I can easily build it". I just tried the other melamine insert and it is almost flush. So the plate is fine and the melamine inserts I received have different thicknesses.